200-gram vinyl plated and pressed by Quality Record Pressings! The telegram asked young Armstrong to join Oliver's celebrated Creole Jazz Band in Chicago, a band which was then generally accepted as the best jazz band in existence. Armstrong leapt at the opportunity, took off for Chicago immediately and for the next two years Louis and Oliver formed the most brilliant two-horn team the jazz world has ever heard. Such a great album, as this one is, deserves the Analogue Productions reissue treatment. Remastered by Bernie Grundman from the original analog tape, the 200-gram super-silent pressing from Quality Record Pressings showcases the sound better than it's ever been heard before. We've topped off the premium vinyl with a tip-on style jacket from Stoughton Printing. This record is Armstrong's tribute to the man who helped shape his trumpet style back in New Orleans and whose invitation to join his band in Chicago put him in the spotlight which has shone on him ever since. There is a heck of a lot of good music on this all-star album. 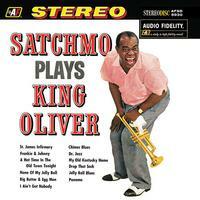 The songs are tunes either written by King Oliver, or tunes that Oliver played. "St. James Infirmary" is taken at an incredibly slow and eerie pace, and when Louis comes back to repeat the main theme at the end, the effect is breathtaking. Louis sings a charming version of "Frankie And Johnny" accompanied only by an old-time honky tonk piano. "Jelly Roll Blues" is a beautiful take on the Jelly Roll Morton Classic. "Chimes Blues" is deep and bluesy return to the tune Oliver and Armstrong first recorded way back in 1923. The title "Old Kentucky Home" may seem out of place, but musically the song fits right in, and when Armstrong prompts his band to sing along with him for a chorus, the result is rather touching. "Panama Rag" is a joyous up tempo romp, and "I Ain't Gonna Give Nobody None Of This Jelly Roll" is pure Satchmo fun, with Armstrong not in the mood to "give nobody none to save their soul." There is a good amount of straight-up blowing on this album, and the recordings have a more informal feel than Armstrong's other two "plays" albums — Plays W.C. Handy and Satch Plays Fats. Step back in time and have Louis right there with you...a great experience!